If you don’t see me here this week, it’s because I’m buried under this big quilt! I am so excited to finally be quilting this one (it’s been a long time coming!). I absolutely can’t wait to have it on my bed! Here’s hoping Max will take some good naps so I can sneak in a little quilting time! 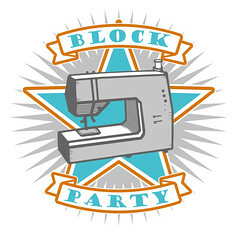 This entry was posted in Posts about Quilts and tagged Block Party, denyse schmidt, drunk love, handmade, quilt, quilting, quilting bee. Bookmark the permalink. 23 Responses to busy quilting! It’s great to see pics of what it looks like to do all of that quilting. I haven’t taken on a full size quilt yet myself and I’m a bit intimidated by the process. It helps seeing your machine amid all that fabric. I love the colors! Can’t wait to see the final product. This looks stunning already! 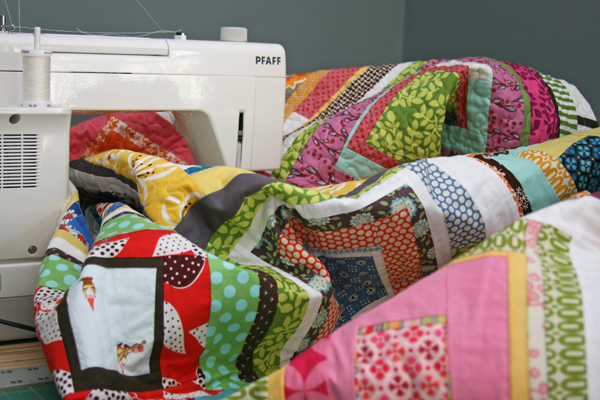 I know that quilting a quilt that big can be physically exhausting – stay strong! I’ll send good nap wishes your way if you send them over here, too! That quilt is gorgeous, can’t wait to see it finished! It’s going to be great! Love that sky blue fabric with branches on it that we got a glimpse of! First of all, love your blog and am a subscriber :)….I don’t see any pins, how did you baste this to hold it in place? I would be willing to tackle machine quilting something this big but not sure how to get it to ‘stay’ in place. Any ideas? I love that you use a Pfaff too! I love mine. I’ve had my mom’s old one for over 30 years and just recently got a new one! My dad is an upholsterer and has used commercial machines for over 50 years! Love your blog. I can’t wait to see it too! It looks so cheerful! Wow, I’m surprised you can even see what you’re quilting, go you! Well it looks mighty nice right there on your sewing machine so I’m sure it will be awesome on your bed! Love all that colorful scrappiness you have going there. Awesome! Such a bright and happy quilt. I love going to bed and sleeping under this kind of quilt. 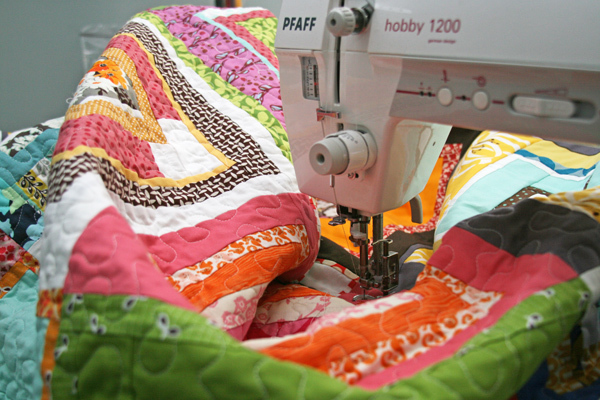 How fun to be in the midst of quilting this beauty! I bet it feels good to get in your zone while working away. Enjoy! Love your colors! That’s a big project! I’m a scaredy cat when it comes to free motion machine quilting. 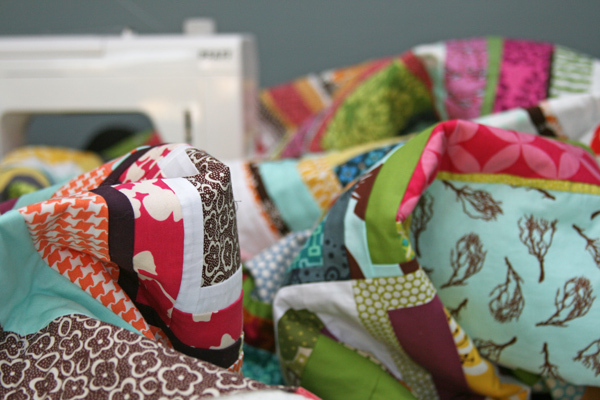 Hope naps are plentiful and you get some quilting time in. I spoil myself with full quilting days when the boy is at school and I have the day off. 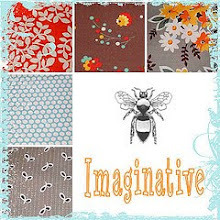 I am a beginning quilter and I have been reading your blog for months. I love how you create your own patterns and style which is what I want to do. Thanks for your weekly inspirations and knowledge of fabrics! This is a beautiful, joie de vivre quilt. Wow, this one looks really pretty and bright! Hope you get a lot of nap times.